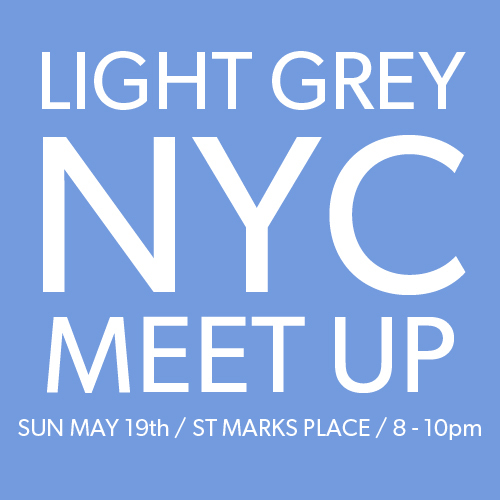 Light Grey New York City meet-up! Hey! We're headed to NYC and we would love to get together with you! What are you up to on Sunday, May 19th between 8 - 10pm? We are super excited about heading to NYC in a couple weeks and we want to put some faces to some names! Are you in the New York City area? Then come out and say hello! We all know the internet is great and all, but nothing beats some person-to-person action. If you happen to be in the neighborhood, you should come hang out with us! Jenny Bookler and I will be parking ourselves along St Marks Place (Between 2nd and 3rd) for some good ole' people watching, psychic readings, Pink Berry eating and bubble tea drinking. We get to go to NYC once a year and this is our chance to say hello and tell you how much we love you!! We put together a quick facebook invite for anyone that wants to get more information about where we'll be, and what we're up to. We'll be lounging around looking forward to meeting you guys in person!! Do us a favor and if you think you might be around, give us a comment either here, twitter, or on facebook so we know to look for you! :) We hope that we'll get to say hello and that you'll also get a chance to meet some other awesome artists while you're at it!